It may be 12 months away but cruise aficionados might like to know on Tuesday 3 July 2012 P&O will be able to parade no less than seven ships at Southampton, maybe not a record from times gone by, but certainly so with regard to passenger vessels. If you are a ship fan you might want to make a booking on one of Carnival’s best, or put the date in your diary for next year to be in Southampton. However AERBT would suggest keeping away from the port in the morning when deboarding passengers could be mixing with early cruisers rushing to join their ship as early as possible. Azura, Adonia, Arcadia, Aurora, Oriana, Oceana and Ventura. All sizes and all prices, as they say. Our 10-story news review follows. RMS Queen Mary 2 is without doubt the flagship of Britain’s passenger shipping fleet. Other, perhaps even more exceptional, ships have come along since she was named by Her Majesty in January 2004, but in terms of sheer bulk and grandeur there has been nothing to challenge her. QM2, as she is affectionately known, is a true ocean liner, the last of the breed, able to operate across that most challenging of seas, the North Atlantic, all year round. But she is also a cruise ship, happy to meander in the Caribbean in the winter season, and is perfectly adept in taking an annual World Cruise, finding her way to some exotic and lesser known places. 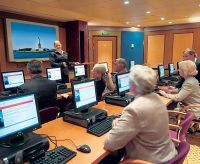 Back in 2005 your Editor was able to take a voyage from New York to Southampton remarking at the time that out by British Airways in Club World, and back in QM2’s Princess Grill class offered terrific value. Things have not changed that much, nor prices. 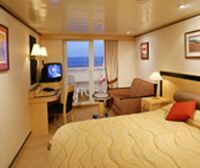 It is still possible to board the ship at Southampton, spend seven nights on board and return to Heathrow with prices in 2012 from £949. Add a superior cabin, move to World Traveller Plus, and stay a few nights in New York and the bill can go up. Negotiate. The large agencies with their bulk buying can sometimes offer really attractive prices out of season. Usually on offer is some shipboard credit, which can come in quite useful. With the pound sterling at US$1.60 Cunard offers remarkable value with the package full board plus a massive variety of entertainment. You need to add tipping at US$11 per day and bar charges, plus any sundry items, typically the spa and, for those who indulge, the casino. There is a good variety of shops too, for those items you forget to pack, and for quality clothing. Harrods, H. Stern, Chopard and Hermes are represented, offering from voyage souvenirs to exquisite jewellery and high fashion. 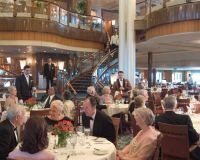 QM2 is a very British ship in terms of its décor, ambience and senior officers. But your fellow travellers will be for the most part American (North and South), and the currency of the ship is the US Dollar. QM2 is not the world’s largest passenger ship but is the world’s largest liner. With a maximum of 3,090 clients (including the little ones) it has nothing like the capacity of RCCL resort monsters (6,296), and is better off for that. 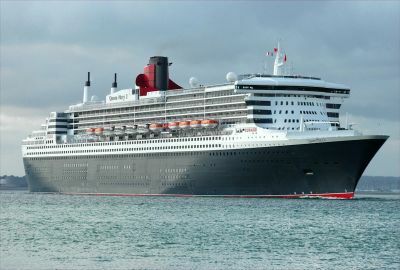 What is very apparent once you are on board is the ship’s width, much wider (147.6ft) than the new Queen Elizabeth (105.9ft), which was built to transit the Panama Canal. The covered promenade deck is just over three laps to the mile and there is an extremely well equipped Sports Centre fitness area on deck 7. If when booking cabins are available amidships grab one. It is probably the best place to secure and cuts down the walking. If you are that way inclined you can take an inboard stateroom that overlooks the three storey atrium. There are 13 decks and five sets of elevators. 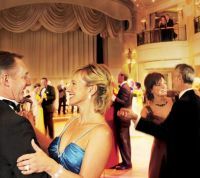 The Queens Room is said to be the largest dance floor at sea. There are two large theatres in the bow, one of which doubles as a planetarium and both offer big screen Hollywood as well as West End standard live shows and a whole variety of lectures by names you will be familiar with, Cunard's very successful "Insights" programme. 3D has recently been added. ConneXions is an education centre where various classes are held daily including off course the latest desktop software. Internet is available (use up your shipboard credit) but you are at the mercy of the satellites and it can sometimes be infuriatingly slow. Some people prefer to be completely cut off, or you can read the day’s news in the library, the largest at sea. Queen Mary is a three (or even four) class ship but that is not evident once on board and will not affect your enjoyment. Suffice to say this review will concentrate on Britannia Class, excellent value and seamless as you explore the ship. Queens Grill clients gain massive suites, a butler, their own restaurant, a private lounge and various minor garnishing. Likewise Princess Grill diners are accommodated in very nice large cabins, but the butler does not come with the package. The three-storey high Britannia Restaurant now features a private area called Britannia Club for passengers in the top priced standard balcony cabins, single seating and with (even more) extra dining options. The Kings Court is the daytime self-service dining alternative which, in the evenings, is transferred into four different dining venues: British, Italian, Asian and what is termed “Chef Gallery” with live cooking demonstrations. Waiter service and tablecloths are provided. The ship has 10 dining options including the very popular Golden Lion Pub with darts, karaoke and a good selection of beers. A pub lunch served every day, with classic favourites such as fish and chips and cottage pie. Todd English, the Boston restaurateur is represented on board with his Italian/Mediterranean cuisine and cover charge of US$30. There are five swimming pools including the delightful Pavilion with its sliding roof. A unique exhibition located throughout the ship's corridors and stairwells unveil Cunard Line's proud history from Sir Samuel Cunard's first venture across the Atlantic in 1840 to the building of Queen Mary 2. Something along the same lines is viewable on your cabin TV too. The children’s/young persons’ dedicated area is fully supervised and probably the best afloat. Called The Zone and Playzone the number of ‘clients’ can range from single figures to many hundreds in the Caribbean during the US end of the year holiday season. 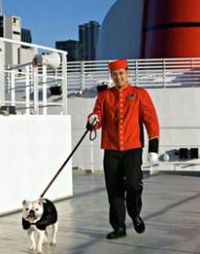 You can take your dog too on the transatlantic voyages, PET approved and costing US$300/500. They are only allowed on Deck 12 where there are kennels, also an exercise area and an indoor lounge for bad weather where owners can sit with their pets. PROGRAMME Sadly QM2 no longer sails up the Hudson River to berth at Pier 90 within walking distance of Times Square. Cunard/Carnival passengers now use the old Red Hook/Brooklyn freight pier, which is great for JFK airport but not much else. The real good news is that since earlier this year QM2 takes seven nights to cross the Atlantic instead of six. Even better value for money and clearly owner Carnival has looked at a spreadsheet of fuel costs against staffing levels and the food bill. Up until the end of August this year QM2 will alternate between Transatlantic crossings and in the main seven-night Northern Europe voyages. New York and the St Lawrence seaway is her home at the end of September before once again offering the only regular shipborne service between the United States and Europe. Non-flyers book their travel to suit. At the end of November the ship comes out of service for two weeks for its first major overhaul and upgrade since its launch. All we can say is “watch this space”. By Malcolm Ginsberg with the help of Phillippa and Ivan Gold who recently flew BA to Montreal, drove south, hooked up with Amtrak at some point, stayed three nights at the Holiday Inn, Long Island, and cruised home to Southampton. A 14-day holiday for well under £3,000 including a balcony. Crystal Serenity has emerged from dry dock to begin a series of Baltic, British Isles and North Cape cruises. Come August she then sails to the Mediterranean for a variety of late summer and autumn mostly 10-day trips. Hapag-Lloyd Cruises is visually unifying the appearance of its fleet. After a 13-day shipyard stay at Blohm & Voss in Hamburg (Germany), the Hanseatic, at 8378 tons and 184 passengers, now features the line’s characteristic orange and blue colours as well as an orange funnel. The comprehensive shipyard stay consisted of more than 780 items, among them the renovation and modernization of two cabin decks, the buffet restaurant, and the sauna and pool area. P&O Cruises is to expand its fleet with a 141,000 ton cruise ship, built by Italian shipbuilder Fincantieri, scheduled to enter service in March 2015. Oceania Cruises and Regent Seven Seas, sister companies and owned by Apollo Management, which also has a 50% interest in NCL, have expanded and enhanced their international sales teams. Princess Cruises has announced that smoking will no longer be allowed in passenger staterooms or on balconies, effective on all sailings departing after 15 January 2012. The new policy reflects changing customer preferences and the move around the globe (from North America to Europe) to further restrict areas where smoking is allowed, according to the line. “Our consumer studies now show that smokers are a small minority of our passengers, and that the large majority of passengers value having their primary living space onboard smoke-free,” said Jan Swartz, Princess Cruises Executive Vice President. Royal Caribbean International’s Radiance of the Seas (90,000 tons/2,000 passengers) emerged earlier this month after 21 days in dry dock as part of the cruise line’s most extensive revitalisation programme. The changes see the ship welcome almost double the previous number of restaurants, more accommodation and a new baby and toddler nursery. 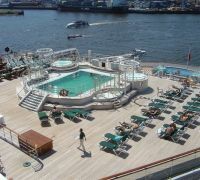 Seabourn has taken delivery of Seabourn Quest (32,000 tons 450 passengers) at the T. Mariotti shipyard in Genoa (Italy). The intimate, all-suite ship is the third vessel constructed by Mariotti for Seabourn’s fleet, completing a three-year expansion that increases the ultra-luxury line’s capacity by more than 200%. Silver Whisper's first-ever World Cruise, which embarks at Fort Lauderdale on 6 January 2012, includes Robin Hanbury-Tenison OBE, Founder and President of Survival International who leads off on the Rio de Janeiro leg). Bestselling author Bill Bryson joins the ship at Singapore on 3 March and stays until her arrival at Shanghai. Concluding in Monte Carlo the voyage will visit 45 ports in 27 countries stretching from the Caribbean and South America to Africa, the Far East, Arabia and Europe. Along the way cruisers will enjoy 13 overnight visits and exclusive insider access to seldom seen global treasures. Voyages of Discovery has announced the latest set of refurbishments to the ship of that name, part of the All Leisure Holiday Group. Internet was already on board but an enhancement will extend coverage previously only available in certain areas. Media Players have replaced the older DVDs, playing content into both cabins and the ship’s cinema in order to show a greater range of newly released and classic movies. Unlike other cruise lines, Discovery has not opted for interactive TV where guests pay for what they watch; instead new releases will be shown much quicker than DVD release dates and daily programming will be advised in the Discovery Times information sheet on board. Windstar Cruises has become part of Xanterra Parks & Resorts, a privately-owned United States park and resort management company based in Greenwood Village, Colorado, controlled by entertainment magnate Phillip Anschutz. Denver-based billionaire Anschutz, has an extensive history of developing and operating mineral, railroad, news media and entertainment enterprises. He is a soccer enthusiast.